Available in 50lb and 100lb. models. 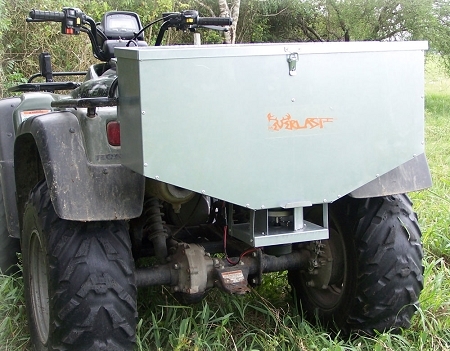 Our Tail-Gate Feeder can be attached to most ATVs and/or to the back of a pickup or jeep to attract game to your feeding area. This very simple unit will provide many years of use and enjoyment in feeding wildlife. Constructed of solid steel and controlled by a 12 volt sealed motor with stainless cupped spinner for maximum performance.